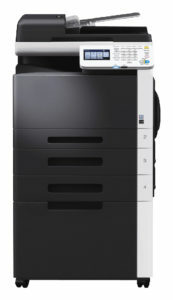 http://nicksrestaurantmadison.com/?display=ContactUs next page The MFX-C3035 is a robust, cost-effective color MFP solution to satisfy the document workflow demands of workgroups, branch offices and small to mid-size businesses.The MFX-C3035 is the perfect document solution for workgroups that want to cost-effectively add color to everyday business documents such as financial reports, sales forecasts and internal presentations. Print and copy documents in less time and with better results using the MFX-C3035. The MFX-C3035 prints and copies at speeds up to 31 ppm at 600 x 600 dpi. Full color and B&W scanning is available at 31 images-per-minute. Scan functions include: Scan-to-Email, Scan-to-FTP, Scan-to-HDD (Scan-to-User Box), Scan-to-SMB (Scan-to-Desktop) and Scan-to-USB. Out of the box the MFX-C3035 integrates with your business solutions. The latest Windows, Macintosh and Linux drivers, PCL and PS3 emulations, and native XPS functionality handles print files in any format your network requires. PDF and JPEG Direct Printing save time by processing and printing files without opening software applications. The 8.5″ color touch screen displays thumbnails of your documents, can be adjusted to an optimal viewing angle and includes features such as the guidance key to walk users through machine operations. TEC value of 6.48 kWh which satisfies the stricter Tier 2 rating of the new Energy Star® standard for energy-saving performance.